If you have a sliver of space between the fridge and the wall in your small kitchen, consider making this hidden DIY rolling pantry. 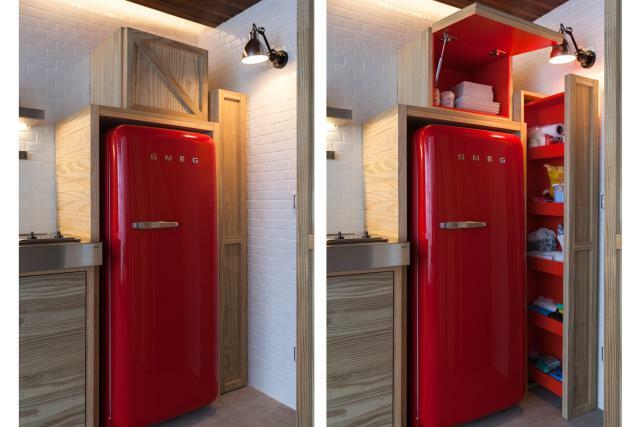 It’s perfect for storing canned goods and other nonperishable kitchen essentials. 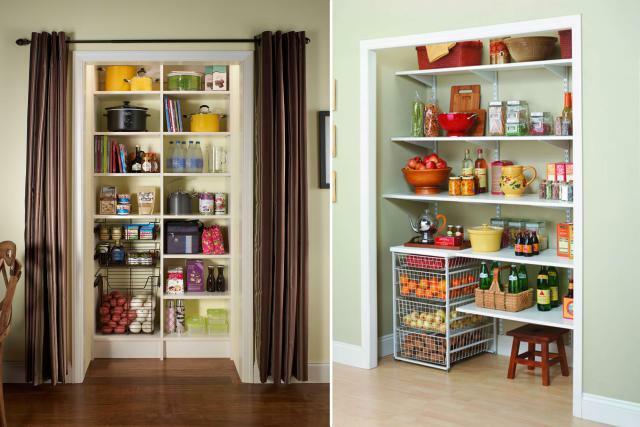 Don’t waste the spaces around the fridge, you can do the hidden rolling pantry like above to store your kitchen stuff. A stainless steel pegboard backsplash is a great double duty feature that protects kitchen walls from spills and splatters while keeping tools that you often use handy. The backsplash shown here is a one-of-a-kind design. However, you can make one yourself. You can find stainless steel pegboards at most home improvement stores. 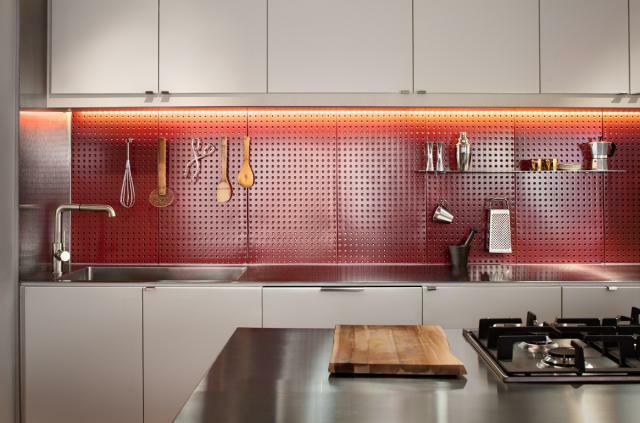 A pegboard backsplash can save your time by drilling the wall for hanging your kitchen stuff. You may just buy some hanger to hang up the kitchen stuff. 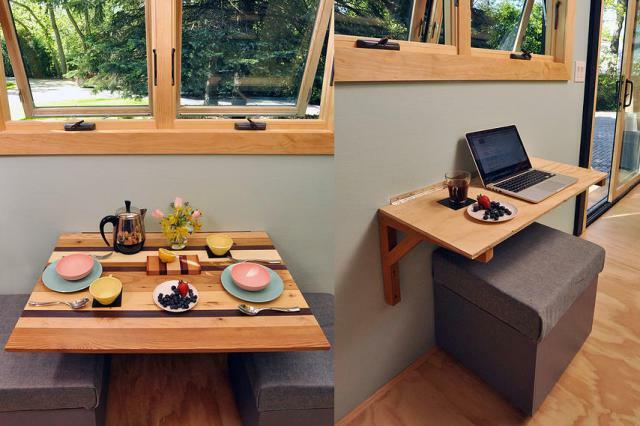 A folding table, like this one you can DIY, can provide a spot where you can prepare and eat food without taking up valuable floor space. Its an excellent idea to save your house spaces. We love how this tiny cottage kitchen keeps the countertop clutter-free using several clever storage solutions. Below are our favorite ideas. The three toe kick drawers under the kitchen’s base cabinets put the space that traditionally goes to waste behind baseboards to good use. You can retrofit most standard base cabinets for toe kick drawers. 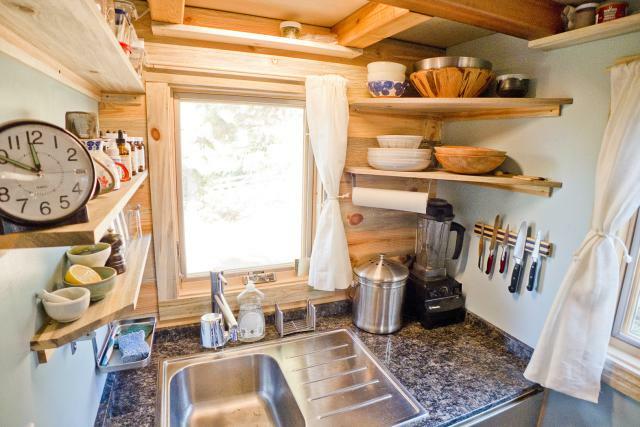 A curtain rod creates a smidgen of vertical storage for utensils in front of the window. 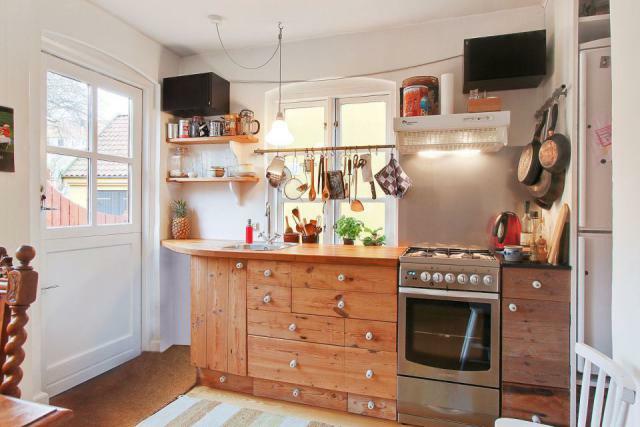 And of course, we need to point out the small pot rack that’s conveniently placed next to the oven. 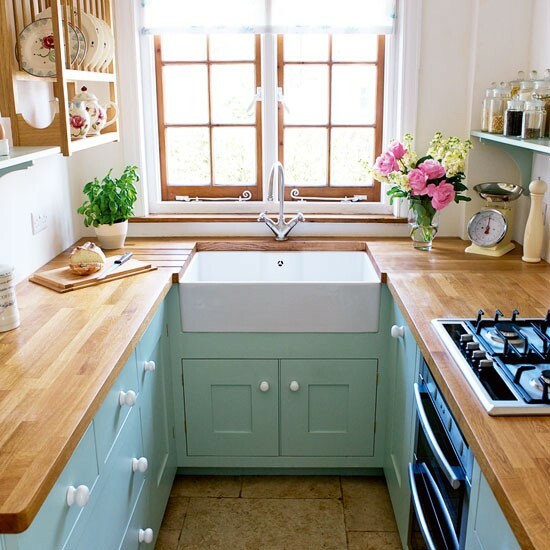 There is no problem to set up a countertop in your small kitchen, just follow the above ideas. Sure, a kitchen island can create additional counter space in a small kitchen. 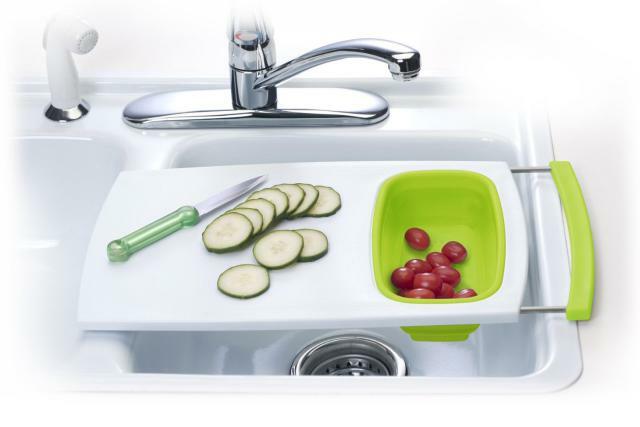 But if you can’t spare the floor space, an over-the-sink cutting board is an ingenious quick fix. This one allows you to rinse before chopping. You can find this cutting board in any accessories store. Do measure the size of your kitchen sink as well. If there’s not enough space in your tiny kitchen to create the storage you crave, consider using a nook or closet in a nearby room. A recessed niche can be used to stash kitchen tools you occasionally use or nonperishable pantry items. A curtain, as shown on the left, can keep what you store out of sight. Before doing it, you need to find a professional to help you to cut out a space. Alternately, you can save the cost if your house has an empty room for you to store the kitchen stuff. Corner space is usually underutilized in many homes. But when you’re trying to make every square inch in your small kitchen count, corner shelving can give these awkward spots a purpose. Don’t waste the corner of your house. Sometimes, you can set up the useful spaces at the corner.